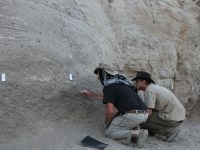 Earth Institute explorations have led to vitally important new discoveries. 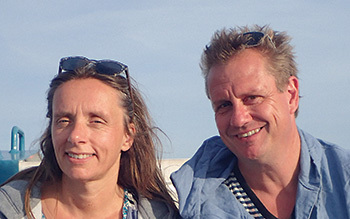 In 2017, Gisela Winckler and Joerg Schaefer from the Lamont-Doherty Earth Observatory developed findings about the history of Greenland’s ice sheet that have incited new questions around science’s understanding of the Arctic. Here is the story from Lamont-Doherty’s 2017 annual report. Meanwhile, our 2018 field work season is already in full swing. A combination of processes determines future sea level rise: thermal expansion of the oceans (the seas swell when water warms); the melting of the ice sheets that cover Greenland in the extreme north and Antarctica in the extreme south; and mountain glacier retreat, the melting of glacial ice on Earth’s mountain ranges. Projections of sea-level rise by the end of this century hover between two and three feet, but many, including predictions compiled and synthesized by the Intergovernmental Panel on Climate Change, do not take Greenland into account. For decades, scientists believed that the Greenland Ice Sheet is relatively stable compared with the vulnerable West Antarctic Ice Sheet. Two Lamont scientists questioned this assumption about Greenland’s ice and wanted to take a much closer look. 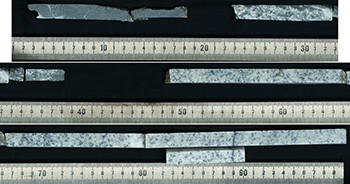 To find answers, geochemists and climate scientists Joerg Schaefer and Gisela Winckler needed to obtain a portion of what is one of Earth’s rarest geologic samples, the only bit of bedrock yet retrieved from the base of the Greenland Ice Sheet, drilled from nearly two miles below the summit of the ice sheet and into the bedrock more than two decades ago. “It is the most expensive piece of rock ever retrieved on Earth,” said Schaefer. The National Ice Core Laboratory in Lakewood, Colorado, where the core is archived granted the scientists a small portion to subject to geochemical analysis. Both Schaefer and Winckler specialize in an analytical process that dates samples with cosmogenic nuclides, isotopes produced by tiny particles from outer space that constantly bombard the planet. Specific isotopes are characteristic of exposure to the open sky. Winckler and Schaefer posited that if they could access the surface of Greenland that lies beneath the ice sheet, they could test for the presence of these isotopes and thereby illuminate the history of Greenland’s ice cover, giving scientists a clearer picture of its stability. What they discovered upends aspects of the world’s understanding of polar ice and its impact on the future of the planet. “The two nuclides we analyzed clearly told us the bedrock that sits underneath the summit of Greenland was exposed for a substantial amount of time,” Schaefer explained. “This simple measurement gets rid of the idea that Greenland is a stable ice cube,” said Schaefer. “The fact that we measured a certain amount of these cosmogenic nuclides means this whole thing was open to the sky. All of the ice was gone,” said Winckler. Their analysis shows that Greenland was deglaciated for extended periods during the Pleistocene epoch (from 2.6 million years ago to 11,700 years ago), on the basis of their measurements of cosmic-ray produced beryllium and aluminum isotopes in the bedrock core. Within the rock, the scientists found traces of radioactive beryllium-10 and aluminum-26. The isotopes decay at known rates, and since they cannot be created if the rock is covered with ice, their abundance can be tied to the time when the rocks were exposed. Modelers agree that the region where the core was taken would be one of the last to melt were the ice sheet to disappear. The authors thus concluded that the ice sheet must have been down to less than 10 percent of its current mass when this site was ice-free. Scientists disagree about which potential forces might tip the Greenland ice into quick decline. These could include water percolating from the surface to lubricate the ice sheet’s base, or massive ice streams discharging icebergs into the ocean. “That’s the big worry, not today or tomorrow, but that there could be something in the system that is catastrophic. All of a sudden, not gradual, and then the ice is breaking up,” said Winckler. These findings will inform new models of Greenland’s ice. 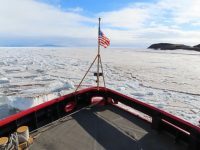 Winckler and Schaefer say their next step is to obtain funding to do a more comprehensive study of the bedrock beneath the ice, to develop a more detailed picture of the past, present, and future of the Greenland Ice Sheet.